Kavanagh Tuite Architects collaborated with artist Shane O’Driscoll to produce a series of 6 large scale screen prints for Ornua’s office refurbishment at Grattan House, Mount Street Lower, Dublin 2. We are currently refurbishing the building which was originally designed by Stephenson Gibney Architects in the 1970s. Hi Shane, tell us a bit about yourself and your background in art. I am a Cork born artist and a member of Cork Printmakers and Graphic Studio Dublin. After learning printmaking while in college I never stopped! I really enjoy the handmade element to it, as I spend my days in front of a computer screen working in graphic design and really enjoy my time in the print studio. I have always had an interest in art; my parents often took us to galleries when growing up and encouraged any creative pastimes. After college I curated a series of art exhibitions throughout Ireland and in New York with a friend, while also still printmaking and exhibiting my own work globally. I have exhibited in the National Print Gallery and have a number of works in the OPW collection. Recently I was asked to design a window for Brown Thomas on Grafton Street, so it’s quite exciting seeing the variance in commissions that I get to do. 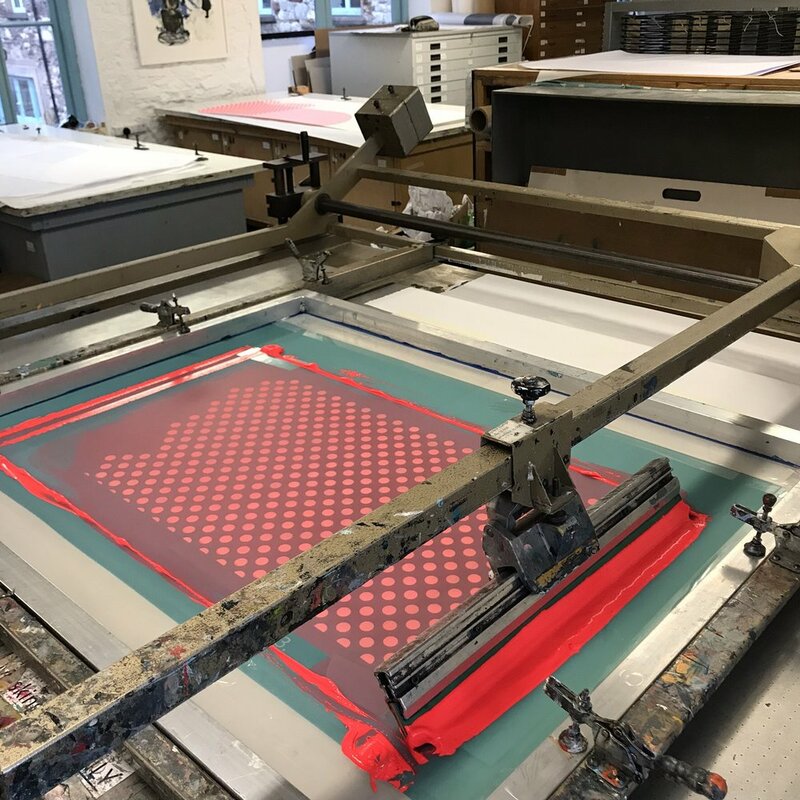 Why do you use screen printing as your main medium? The bold graphic elements of the process always appealed to me. I think studying graphic design and poster art led me to screen printing, as that was a popular way of creating print multiples before digital print. Talk us through the concept behind your work for this series? When approaching this commission for Ornua, we had to get the best coverage of the space without it being too overbearing. My work has quite bright colours, but that’s balanced with white space, so finding a balance and harmony in the composition was key. Natalie and I decided to create a diptych and triptych that connected along the hallway, so there is a flow between the artworks that leads the eye along the space. The scale was dictated by the walls and creating work this size was new for me, but an exciting challenge. I used my own palette with gold incorporated as a reference to Ornua, which is Irish for “New Gold”. Each colour is hand printed individually and the larger colour blocks are created from two stencils. Aligning shapes needed to be fast, as the ink starts drying the second its applied to the stencil. An even pressure has to be applied when putting the ink down and it’s quite a physical process at this size. Even lifting 6x3ft pieces of paper carefully was testing. This is your first time working in collaboration with an architect. How did you find this experience? Usually I can be looser in my approach and compositions can be altered during the process on the print table, but this needed more planning and sign-off before commencing the work. This meant quite a few artwork versions were created before sign-off. It was fun to see Natalie’s vision for my work in the space and how it would transform the office. All the considered elements already in the building had to align with what I was making. Overall it was a really enjoyable project and everybody involved was a pleasure to work with. Lastly, who are your artistic inspirations? I’m a big fan of American artists Thomas Campbell and Cody Hudson, they really enjoy creating their artwork and it comes through in the art. I really admire Irish artists Patrick Scott and Richard Gorman for their dedication and attitude to their work. Musically, Nick Cave and Beck inspire me, as their art form is an extension of them as unique individuals, which is a rare thing.